The new Mazda CX-5 has been praised by Car and Driver for its “distinctive styling and engaging driving dynamics,” which sets the Mazda CX-5 apart from its competitors like the Nissan Rogue. 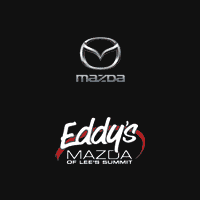 Browse our inventory of new Mazda CX-5 FWD and AWD models online, then visit Eddy’s Mazda of Lee’s Summit, located near Kansas City and Overland Park, for a test drive! Get today’s lowest special internet price on this vehicle now! Please fill out this form below and we will get in touch with you shortly. By submitting your information you agree to be contacted electronically including text, email, and phone call. * 13 people have viewed this vehicle! * 32 people have viewed this vehicle! Factory MSRP: $27,910 $1,565 off MSRP! 25/31 City/Highway MPGMachine Gray 2019 Mazda CX-5 4D Sport Utility Touring 2.5L 4-Cylinder 6-Speed Automatic FWD 25/31 City/Highway MPGOur experienced sales staff is eager to share its knowledge and enthusiasm with you. We encourage you to browse our online inventory, schedule a test drive and investigate financing options. You can also request more information about a vehicle using our online form or by calling (816) 434-6040. Servicing the greater Kansas City area (MO & KS) including Overland Park, Olathe, Lawrence, Lenexa, Manhattan, Hutchinson, Leavenworth, Topeka & Mission. * 41 people have viewed this vehicle! Recent Arrival! Factory MSRP: $28,205 25/31 City/Highway MPGRed Crystal 2019 Mazda CX-5 4D Sport Utility Touring 2.5L 4-Cylinder 6-Speed Automatic FWD 25/31 City/Highway MPGOur experienced sales staff is eager to share its knowledge and enthusiasm with you. We encourage you to browse our online inventory, schedule a test drive and investigate financing options. You can also request more information about a vehicle using our online form or by calling (816) 434-6040. Servicing the greater Kansas City area (MO & KS) including Overland Park, Olathe, Lawrence, Lenexa, Manhattan, Hutchinson, Leavenworth, Topeka & Mission. Recent Arrival! Factory MSRP: $28,985 25/31 City/Highway MPGJet Black 2019 Mazda CX-5 4D Sport Utility Touring 2.5L 4-Cylinder 6-Speed Automatic FWD 25/31 City/Highway MPGOur experienced sales staff is eager to share its knowledge and enthusiasm with you. We encourage you to browse our online inventory, schedule a test drive and investigate financing options. You can also request more information about a vehicle using our online form or by calling (816) 434-6040. Servicing the greater Kansas City area (MO & KS) including Overland Park, Olathe, Lawrence, Lenexa, Manhattan, Hutchinson, Leavenworth, Topeka & Mission. Factory MSRP: $28,985 ABS brakes, Active Cruise Control, Alloy wheels, Electronic Stability Control, Emergency communication system, Front dual zone A/C, Heated front seats, Heated Front Sport Seats, Illuminated entry, Low tire pressure warning, Remote keyless entry, Traction control. 25/31 City/Highway MPGJet Black 2019 Mazda CX-5 4D Sport Utility Touring 2.5L 4-Cylinder 6-Speed Automatic FWD 25/31 City/Highway MPGOur experienced sales staff is eager to share its knowledge and enthusiasm with you. We encourage you to browse our online inventory, schedule a test drive and investigate financing options. You can also request more information about a vehicle using our online form or by calling (816) 434-6040. Servicing the greater Kansas City area (MO & KS) including Overland Park, Olathe, Lawrence, Lenexa, Manhattan, Hutchinson, Leavenworth, Topeka & Mission. Factory MSRP: $28,985 25/31 City/Highway MPGEternal Blue 2019 Mazda CX-5 4D Sport Utility Touring 2.5L 4-Cylinder 6-Speed Automatic FWD 25/31 City/Highway MPGOur experienced sales staff is eager to share its knowledge and enthusiasm with you. We encourage you to browse our online inventory, schedule a test drive and investigate financing options. You can also request more information about a vehicle using our online form or by calling (816) 434-6040. Servicing the greater Kansas City area (MO & KS) including Overland Park, Olathe, Lawrence, Lenexa, Manhattan, Hutchinson, Leavenworth, Topeka & Mission. Factory MSRP: $29,185 ABS brakes, Active Cruise Control, Electronic Stability Control, Emergency communication system, Front dual zone A/C, Heated front seats, Heated Front Sport Seats, Illuminated entry, Low tire pressure warning, Remote keyless entry, Traction control. 25/31 City/Highway MPGSnowflake White Pearl 2019 Mazda CX-5 4D Sport Utility Touring 2.5L 4-Cylinder 6-Speed Automatic FWD 25/31 City/Highway MPGOur experienced sales staff is eager to share its knowledge and enthusiasm with you. We encourage you to browse our online inventory, schedule a test drive and investigate financing options. You can also request more information about a vehicle using our online form or by calling (816) 434-6040. Servicing the greater Kansas City area (MO & KS) including Overland Park, Olathe, Lawrence, Lenexa, Manhattan, Hutchinson, Leavenworth, Topeka & Mission. * 16 people have viewed this vehicle! Factory MSRP: $29,285 ABS brakes, Active Cruise Control, Electronic Stability Control, Emergency communication system, Front dual zone A/C, Heated front seats, Heated Front Sport Seats, Illuminated entry, Low tire pressure warning, Remote keyless entry, Traction control. 25/31 City/Highway MPGMachine Gray 2019 Mazda CX-5 4D Sport Utility Touring 2.5L 4-Cylinder 6-Speed Automatic FWD 25/31 City/Highway MPGOur experienced sales staff is eager to share its knowledge and enthusiasm with you. We encourage you to browse our online inventory, schedule a test drive and investigate financing options. You can also request more information about a vehicle using our online form or by calling (816) 434-6040. Servicing the greater Kansas City area (MO & KS) including Overland Park, Olathe, Lawrence, Lenexa, Manhattan, Hutchinson, Leavenworth, Topeka & Mission. Recent Arrival! Factory MSRP: $30,385 24/30 City/Highway MPGSonic Silver Metallic 2019 Mazda CX-5 4D Sport Utility Touring 2.5L 4-Cylinder 6-Speed Automatic AWD 24/30 City/Highway MPGOur experienced sales staff is eager to share its knowledge and enthusiasm with you. We encourage you to browse our online inventory, schedule a test drive and investigate financing options. You can also request more information about a vehicle using our online form or by calling (816) 434-6040. Servicing the greater Kansas City area (MO & KS) including Overland Park, Olathe, Lawrence, Lenexa, Manhattan, Hutchinson, Leavenworth, Topeka & Mission. Factory MSRP: $30,385 ABS brakes, Active Cruise Control, Alloy wheels, Electronic Stability Control, Emergency communication system, Front dual zone A/C, Heated front seats, Heated Front Sport Seats, Illuminated entry, Low tire pressure warning, Remote keyless entry, Traction control. 24/30 City/Highway MPGCrystal Blue 2019 Mazda CX-5 4D Sport Utility Touring 2.5L 4-Cylinder 6-Speed Automatic AWD 24/30 City/Highway MPGOur experienced sales staff is eager to share its knowledge and enthusiasm with you. We encourage you to browse our online inventory, schedule a test drive and investigate financing options. You can also request more information about a vehicle using our online form or by calling (816) 434-6040. Servicing the greater Kansas City area (MO & KS) including Overland Park, Olathe, Lawrence, Lenexa, Manhattan, Hutchinson, Leavenworth, Topeka & Mission. Recent Arrival! Factory MSRP: $30,385 24/30 City/Highway MPGJet Black 2019 Mazda CX-5 4D Sport Utility Touring 2.5L 4-Cylinder 6-Speed Automatic AWD 24/30 City/Highway MPGOur experienced sales staff is eager to share its knowledge and enthusiasm with you. We encourage you to browse our online inventory, schedule a test drive and investigate financing options. You can also request more information about a vehicle using our online form or by calling (816) 434-6040. Servicing the greater Kansas City area (MO & KS) including Overland Park, Olathe, Lawrence, Lenexa, Manhattan, Hutchinson, Leavenworth, Topeka & Mission. Recent Arrival! Factory MSRP: $30,385 24/30 City/Highway MPGEternal Blue 2019 Mazda CX-5 4D Sport Utility Touring 2.5L 4-Cylinder 6-Speed Automatic AWD 24/30 City/Highway MPGOur experienced sales staff is eager to share its knowledge and enthusiasm with you. We encourage you to browse our online inventory, schedule a test drive and investigate financing options. You can also request more information about a vehicle using our online form or by calling (816) 434-6040. Servicing the greater Kansas City area (MO & KS) including Overland Park, Olathe, Lawrence, Lenexa, Manhattan, Hutchinson, Leavenworth, Topeka & Mission. New vehicle pricing includes all offers and incentives. Tax, Title and Tags not included in vehicle prices shown and must be paid by the purchaser. While great effort is made to ensure the accuracy of the information on this site, errors do occur so please verify information with a customer service rep. This is easily done by calling us at 816-774-1100 or by visiting us at the dealership. Why Get a New Mazda CX-5 from Us? Contact our team with any questions you may have, then visit us in Lee's Summit to test drive a Mazda CX-5 today!